The Illinois-based painter’s latest work will be on display (and for sale) through Dec. 16 at Lanesboro Arts. Photos courtesy Ken Reif Artworks. 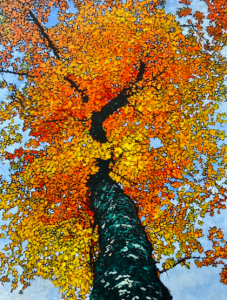 With a flick of the wrist and twirl of his brush, the magic of Illinois-based painter Ken Reif is felt far and wide through the southeast Minnesota city of Lanesboro. 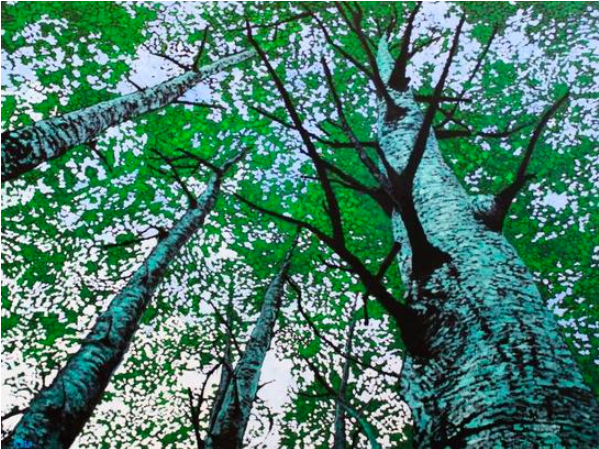 Through “Renewable Energy,” an exhibit of nature-inspired oil paintings, Reif captivates visitors with the familiar feeling of lying underneath the trees, looking through the canopy and up to the open sky. But in this case, it’s not smoke and mirrors: It’s talent. 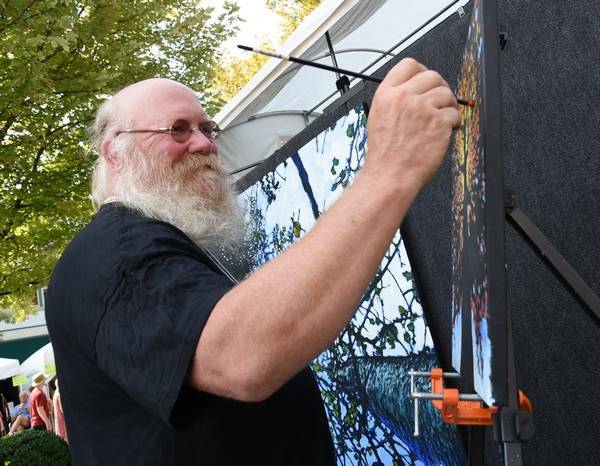 So much talent, in fact, that it secured him a spot to showcase his paintings at Lanesboro Arts—a multidisciplinary arts organization that touches all four corners of the 732-person town. It’s a city-declared, award-winning arts campus with a small historic theater, space for classes, and residence art space with a mission to bring quality art and moderate prices to the rural part of the state. 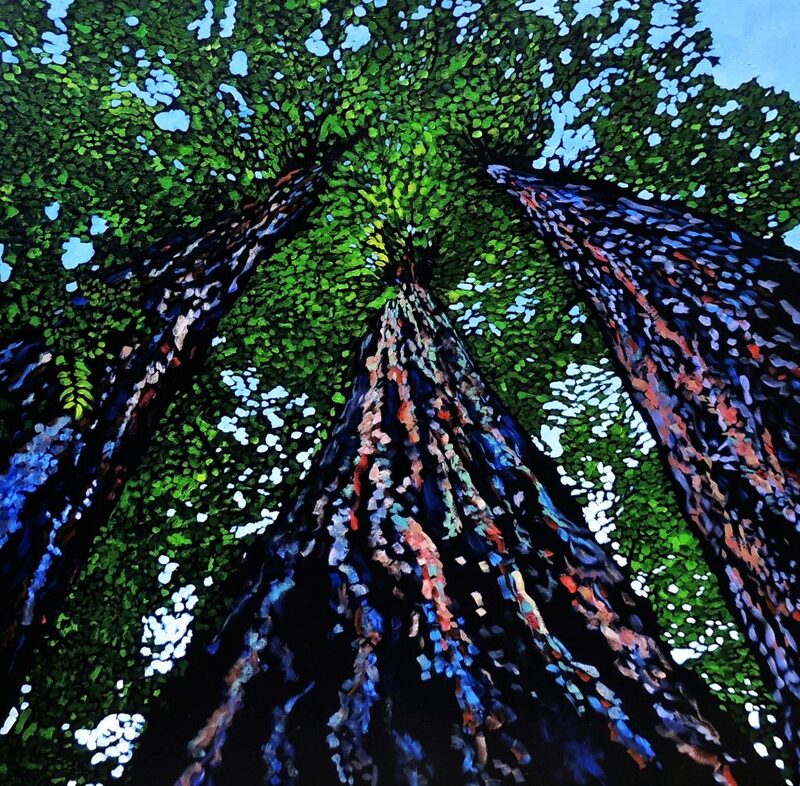 What’s particularly special is their art gallery—an art gallery Reif experienced himself while visiting Lanesboro a few years ago (searching for beautiful trees to paint, of course). He fell in love with the arts center and submitted his work to be displayed there—twice. Robbie Brokken, the gallery director of Lanesboro Arts, plays an integral role in the competitive submissions process. One dozen judges (all art professionals or prominent figures in the Lanesboro arts community) make their selections based on the quality of work, original voice, price point, and presentation of submission materials. For the 2018 exhibition gallery calendar, Reif’s submission fit the bill. “The colors are beautiful, they draw people in, and we just really like the work—period,” says Brokken. She’s not the only one who feels enchanted by Reif. 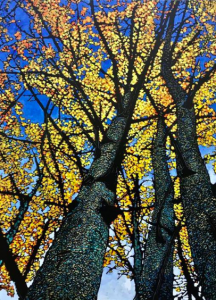 She says the reaction to his paintings have been incredibly positive, with visitors often commenting on the pointillism, photo realism, and meditative quality seen and felt in his work. Though the end result is unlike anything else you’ll see, the creative process is equally unique. That’s how it started. And the rest? History. If you ask him, he’ll tell you his work is “contemporary impressionism.” It’s a mix of realism, abstraction, and fragments of bold color that blend together seamlessly for a tranquil and evoking, yet energizing and emotional effect—complete with striking contrast that make the colors jump from the canvas. Lanesboro Arts is located at 103 Parkway Ave. N. in Lanesboro. Gallery hours are Tuesday-Saturday, 10 a.m. to 5 p.m., and Sunday 11 a.m. to 3 p.m. Artwork is for sale.